When you voluntary provide your name, email address or website name, Health Philippines does not sell, rent or disclose this name, address or website name to third parties. In case a reader of this blog requests for your email address, Health Philippines does not grant the request. However, in cases where Health Philippines believes the request is reasonable, and that the request promotes charity, kindness and compassion in this world, it first asks for a written permission, through email, from the person whose email address is being requested before the email address is provided. The email address will not be given if the person rejects the request. Every reader or user of this web blog can be sure that his or her email address will not be known by anyone other than the owner of this web blog, unless the reader or user has given a written permission thru email. Know that third parties, including Google, use advertising cookies to enable them to fit their advertisements to the preferences of users based on users’ prior visits. If you like to know more about protecting your online privacy, visit the Network Advertising Initiative. Hi gud pm po. Ask ko lng po kung makakapag avail po ba aq ng reimburse. Nanganak po kse ako nitong july 5. merun po akong philhealth dko nagamit. Merun nmn po akong mdr at resibo n binyran q sa philhealth. Hinahanapn pko sa hospital ng rf1 & me5. Hi jhean, are you employed? Some hospitals require RF1 and ME5 only if employed, although cert of premium payments from employer should be enough. If you’re individual payor, go to your hospital and ask for refund because they should have made the deductions. Hi mam,good day. Ask lng po aku if posible po bang ma refund yung mga gamot na binili namin para sa kapatid ko. Na aksidente po xa sa motor pru pina uwi kami ng doctor pagkatapos ng ct.scan result. May makuha po ba kaming refund para sa mga xray’s at ct.scan? Sa ibang hospital po kami ngpa ct.scan at ibang hospital rin po yung mga xray..binayaran na po namin yung bill nya na hindi po nagamit philhealth nya. Sa emergency room lng po xa hindi na confine.. salamat po. God bless. Hi Charo, find a dialysis center offering Philhealth packages. Bring your mother’s medical papers and her husband’s Philhealth MDR and premium payment OR. You can also ask assistance from PCSO to supplement the 45 dialysis sessions per year covered by Philhealth. hi Jocelyn, if she filed her Philhealth, she can wait for her benefit payment notice from Philhealth. She can then later ask the hospital about her refund (Bring notice, hospital bill, hospital OR and ORs for meds). Hi my father is my beneficiary. He has operation for kidney stone, how much is philhealth deduction for bills. hi, if I apply this march 2015 with philhealth and my due date is may 2015, can I use philhealth? hi gab, yes, register asap and pay Jan to Apr or Jan to May, and you can use Philhealth in May. Hello po, is surgery for infection covered by Philhealth. I have surgery on my foot diagnosed as condroblastoma; pinalitan po ng buto ang loob ng ankle ko. After the operation, the wound opened and some fluids came out and almost 2years it has been like this. The doctor told me a bone cement is needed to close the hole from which the fluids are coming out. Another thing is the infection. How much is covered by philhealth if I have the surgery at PGH? Thanks. Hi Aries, sorry I don’t know the exact procedure so I can’t research the list. You can search yourself on philhealth.gov.ph. See SEARCH CASE RATES on the right side of the web page. Or talk to your doctor about using Philhealth. hi gud pm na admit kasi ang anak ko ,,,ask qoh lang po if may refund po ba,,first time ko pa itong nagamit,,9 years na ngaun ko pa nagamit,,na admit ang anak ko march 10 po…kung may refund po,,paano ba e claim…salamat po..
Hi marycress/aldwin, sana naibigay nio ang Philhealth documents nio sa hospital bago kayo nadischarge para na-deduct na agad ang Philhealth benefit from your bill. 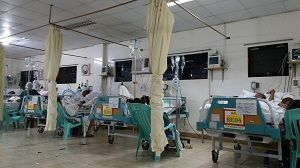 Kung merong valid reason na hindi nio naibigay ang Philhealth papers nio before discharge, hingin nio yong Philhealth at medical papers nio sa hospital kagaya ng waiver from the hospital na ipinapaubaya na nila sa inyo ang Philhealth benefit dahil nakabayad na kayo sa hospital, para kayo na ang mag-file sa Philhealth. Ang tamang procedure kasi is magdeduct yong hospital sa bill at yong hospital ang mag-file sa Philhealth. Ask ko lang kapag neregistered ko mama ko sa philhealth ngaun july tapos bayaran ko advance january to december pwede na bang gamitin ng mama ko? Hi myra, sorry hindi na puedeng bayaran ang Jan to June 2018. Merong payment deadlines. If you pay July to Sep now, at ngayon lang siya nag-member, sa Sep pa siya ma-cover ng Philhealth. Starting Oct 1, hindi muna siya covered, kasi starting Oct 1, payment of 9 months within the past 12 months na ang requirement.